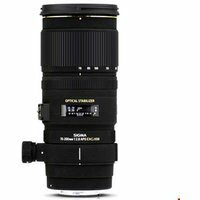 Packed with the latest technology from Sigma and smaller than its predecessor, the Sigma 70-200mm f2.8 EX DG OS HSM lens is the second generation of the large aperture 70-200mm f2.8 telephoto zoom. The lens now incorporates Optical Stabilisation (OS), which helps achieve blur-free shots, even at maximum zoom, and its fast f/2.8 aperture is extremely useful in low light or when shooting fast moving subjects where a higher shutter speed demands maximum light gathering. The HSM (Hyper Sonic Motor) offers quiet and high speed AF as well as full-time manual focus capability, ensuring the Sigma 70-200mm f2.8 EX DG OS HSM lens provides outstanding image quality and ease of use.